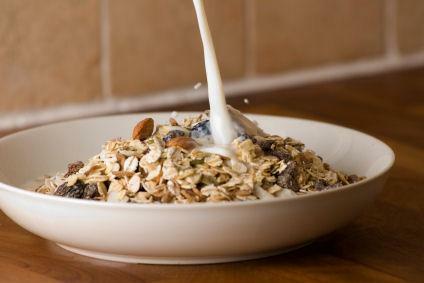 Whole grains, such as oats, are emphasized in the Prism program. The Prism weight loss program is a low-carbohydrate, faith-based program that emphasizes changing a person's way of life rather than temporarily adopting a diet plan to lose weight. The Prism weight loss program was first developed in 1990, and a book on the program was written by Karen Kingsbury, a noted inspirational author and former reporter for the Los Angeles Times. The program has been used by more than 60,000 people, who are encouraged to form or join support groups or take part in a home study course while using the program. The course involves the dietary plan as well as a workbook that includes readings to inspire and change the person's attitude about eating. Support groups meet weekly and include a video presentation as well as discussion with other group members for support and encouragement. The program can also be completed alone with the help of the home study course, which includes the workbook, videos and other helpful materials. The main feature of the diet portion of the program is a low-carbohydrate plan that calls for cutting out white bread, sugar, and other processed foods. In that way it is similar to Sugar Busters, though unprocessed sugars like honey are allowed in the Prism plan. It is often compared to the Atkins Diet, but this plan allows more food choices and is not as high in protein. It also does not have the emphasis on eliminating carbs that come from fruits and vegetables. The diet program includes four six-week phases, and more foods are allowed in each phase, with the aim being getting the person in balance so he or she eats the right amount of a variety of foods. The diet plan calls for about 1,200 to 1,400 calories a day, with an emphasis on healthy whole foods and moving away from white foods and processed grains and other refined products. Weighing foods to ensure the correct portion size as well as counting carbs and calories are a big part of the program, ensuring that people see exactly how much food they are putting into their bodies and being more mindful about their choices. Each phase includes a workbook with 42 lessons, while phases one and two also have weekly instructional videos and week one includes an introductory video and a CD or audiotape for further inspiration. Phases can be repeated as often as you like, or you can stay in one phase for a longer period of time if you prefer. There is also a "continuance" program for people who are seeking to maintain their weight loss. Many reports on the Internet describe this as an easy and effective way to lose weight once dieters recover from the initial shock of eliminating sugar and white flour from their diet. For people who are already spiritually inclined, that aspect of the Prism weight loss program will be attractive. Participants in the program talk of turning the weight problem over to God and recognizing that God always loves people even when they can't love themselves. It also helps people to see that food is intended to nourish us, not comfort us, and changing your attitude about food can also help you lose weight. The idea is to transform the mind as well as the body, and many people who have used the diet plan say that it has brought them a better sense of spirituality as well as a smaller waistline. For people who aren't that into religion, this plan is not a good idea, and there are other low-carb options that might be better for you. But for those who are interested in a diet plan that is more than a short-term quick fix, that can change you body, mind and spirit and bring a more spiritual perspective to eating, this diet plan along with exercise can be quite effective.